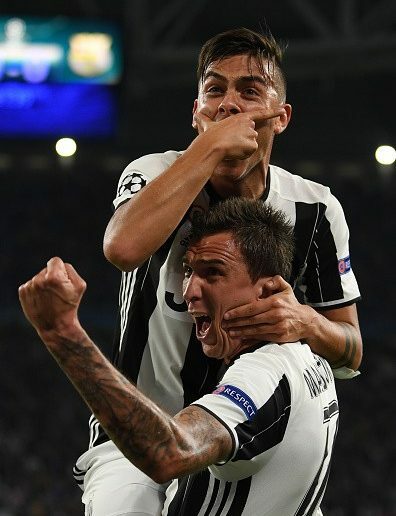 TURIN, ITALY – APRIL 11: Goalscorer Paulo Dybala of Juventus celebrates with team mate Mario Mandzukic after scoring his second goal during the UEFA Champions League Quarter Final first leg match between Juventus and FC Barcelona at Juventus Stadium on April 11, 2017 in Turin, Italy. In a classical Champions League encounter Juventus has beaten Barcelona by 3-0. It was one of the most anticipated matches of the European League. The win is also seen as the revenge of the 2014-15 Champions League final by Turin side. When it comes to head to head performance Barcelona was nowhere compared to Juventus. “The Old Lady Of Turin” has started the game well with high-pressing and created good chances to score. In the seventh Minute the pressure by Juve paid off as Dybala scored an absolutely incredible goal, reports TheGuardian. Barcelona was looking absolutely vulnerable in Defence. Pique, Umtiti, and Mascherano were outplayed by Juve’s forwards. In the 20th minute, Barcelona created a chance as Messi’s gave a sublime pass to Iniesta but he failed to put it on the back of the net. Only two minutes later Juventus scored again with a stunning strike from Paulo Dybala. The Italian side is now started to dominate the game and looking really comfortable in every place of the field. Barcelona had everything to play for in the second half as Luis Enrique made a substitute by benching Jeremy Mathieu and bringing Andre Gomes on the field. But the Barca’s problems just got increased as Chiellini scored a header. From that point of the game, the La Liga champions tried to score but didn’t succeed to score. Notably, the star of the match was the 32-year old Argentine Paulo Dybala. He was absolutely ruthless in the game and single handily destroyed the Barcelona’s defense by scoring two goals, reports BBC. Now Barcelona is looking forward for the home leg and will try to repeat the historic comeback against PSG and the attacking trio, MSN must step up in the Camp Nou to save their team. Juventus were a far better side in the match with really solid performance.